Studying the Bible does not have to be an intimidating or overwhelming experience. The study of God’s Word can be easy and rewarding if you break down the Bible into easy-to-understand segments. 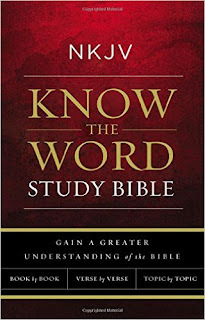 The NKJV Know The Word Study Bible offers three easy ways to begin studying Scripture and helps individuals transition from being a casual reader of the Bible to becoming a regular student of the Word. 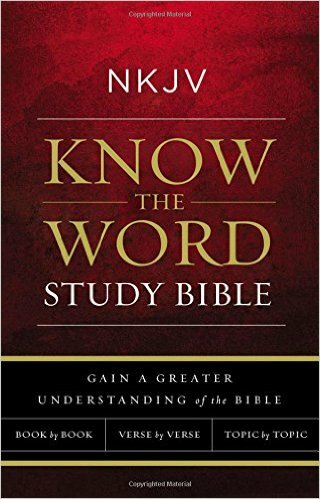 The NKJV Know The Word Study Bible provides three different approaches to studying the Bible. Book by Book, Verse by Verse and topic by topic. I like to do a combination of all three, by using the notes and the guides and when i find a topic of interest, I will study it thoroughly. This bible helps me do that.